Change or create by or as if by magic. All of the above can be used to describe the polarizing filter! Well, maybe it’s not supernatural, but it does work in wondrous ways! And the effect that this filter has can’t be duplicated any other way. You too can become a photo magician. The polarizing filter doesn’t add anything to your images; instead it can remove what’s spoiling your images. It’s a tool that you can’t afford to ignore. In photography, we record light. We record the light that falls on and reflects off of objects. Sometimes these objects are people; sometimes plants; sometimes in-animate objects. But, without light, we’d have nothing to photograph. We see this light with our eyes, but our cameras see this light in a very different way. In a previous e-tip (Dynamic Range eTip), we discussed "dynamic range" and how your camera exaggerates the differences between light and dark. It’s this exaggeration that causes our cameras to see reflections a bit differently than our eyes do – reflections are exaggerated in the camera. When the individual light waves are parallel to each other, the light is considered “polarized”. Direct light is non-polarized. But, when light is reflected from some objects, it can become polarized. The degree to which light is polarized depends on the material it is reflected from and the angle at which the light is reflected. 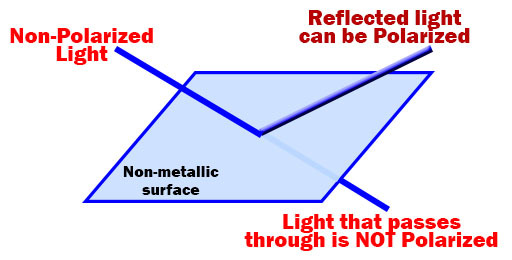 Some sky-light and reflected light from non-metallic objects can be “polarized light”. The light can be polarized vertically or horizontally. Interestingly, the light that is NOT reflected – i.e. the light that goes THRU an object, is not polarized. For example, if you look at shallow water in a pond, the surface is reflecting polarized light, but the light going thru the water and illuminating the bottom is NOT polarized. Polarizing filters can block the polarized light. You can prove this with two pair of polarized sunglasses. Hold one pair of sunglasses horizontally and the other vertically (90 degrees to the first). Align one lens of each and you’ll see very little light transmitted where they overlap. That’s because one pair is blocking horizontally polarized light and the other is blocking vertically polarized light. When you block both, there’s no light left! Reflections are color-killers. In many settings, reflections kill colors. But, sometimes reflections are necessary to preserve color in an image, so it’s important to understand the difference. For example, when photographing a sunrise, sunset or rainbow, it is the reflected light that causes the intense color – you wouldn’t want to eliminate the reflective light. But, in most other instances, reflections will overwhelm the color in your images. Take a look at this image. This is how the camera sees the foliage. But, it’s not actually how the leaves look. The camera sees a lot of reflected sunlight, which creates highlights on the leaves. These highlights change the appearance of the leaf. The center leaf looks brownish, but if you look at the leaves to the right and left, you can see some orange/yellow tones. These leaves have fewer reflections on them than the center leaf, but they still are reflecting some light. A polarizing filter works its magic by filtering out polarized light. Because it only filters the light reflected from your subject, and not the light shining on your subject, it can effectively reduce the reflected light. It’s one of the few critically important tools you have in photography, besides your camera, and a knowledge of how and when to use it can vastly improve some of your images. Here’s this same image, but taken with a polarizing filter. Polarizing filters for cameras are generally round and light-gray in color. They screw onto the front of your lens. The filter is made up of two parts: the part that attaches to the front of your camera lens and an outer ring that contains the filter that you rotate. There are two kinds of polarizing filters: Linear and Circular. Almost all of the polarizing filters sold today are circular polarizers. This is because "Linear" polarizing filters can prevent the metering and autofocus systems from working in most cameras since many cameras use a mirror to reflect light to the meter and autofocus system. The "Linear" polarizer will eliminate this reflected light inside the camera, thus prohibiting these systems from working. Circular polarizer filters won’t do this, but are more expensive to manufacture. They contain multiple layers and if each layer isn’t very high quality (optically), image quality will suffer. One of the most common uses of a polarizer is to darken skies. On a sunny day, a polarizer can darken the blue sky and make clouds "pop". But beware, that a polarizer can overly darken a blue sky, especially when at altitude. This works because the scattered sunlight from atoms and molecules in the sky gets absorbed and re-emitted. When this light is re-emitted light, it becomes polarized. Polarizing filters work best to darken a sky when you're shooting 90 degrees from the direction of the sun. I went for a walk in a nearby park during foliage season here in New England, and took these demo pictures, showing the dramatic magic that you can create with a polarizing filter. All of these images were taken with a Nikon D800, 24-85mm f3/5-4.5 lens. All were taken with auto aperture-priority exposure, and no exposure bias. 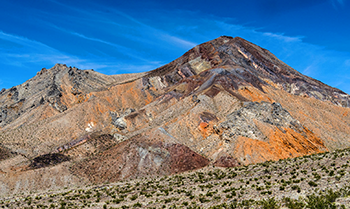 The images on the left were taken with a B&W circular polarizer filter (multicoated). These images are from RAW files, but only a level adjustment and resizing was made to each of them. On any of the images below, click on them for a larger version. In this image, the polarizer darkened the blue sky, and reduced the reflection from the leaves, thus showing the true colors. In this image, the reflections from the water actually obscured the leaves beneath the water. The polarizer was able to reduce the surface reflections significantly. Although there were no "tricks" used here, the difference between these images is true "magic", although you might prefer either image. 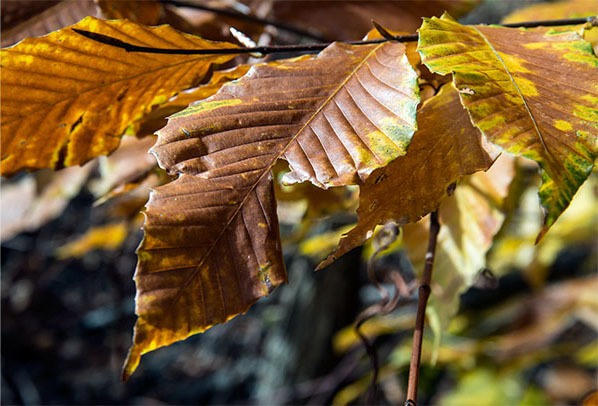 In these images, the polarizer eliminated the reflection from the leaves, showing their true color. It also reduced the reflection from the water. In the lower set of images, you can see how cutting the reflection from the water actually darkens the water. Thus, reducing the dynamic range of the image and improving the color of both the water and leaves. 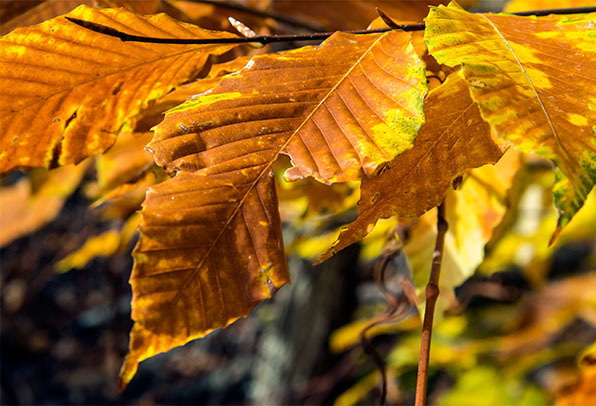 In this image, the color intensity of the leaves is better with the polarizer. In this image, the polarizer was able to significantly reduce the reflection from this store’s glass window. The sign is almost invisible in the image on the right, but quite visible when the polarizer was used. For a polarizing filter to work best, position yourself 90° to the light source. Polarizing filters will do little when the light source is in front of or behind you. Just aim your camera at the scene you’re about to photograph and turn the outer ring of the polarizing filter to view the effect thru the viewfinder. (We don’t recommend using the LCD on digital cameras, as it’s often very difficult to see the effect, especially when you’re in bright sunlight.) One of the great things about using a polarizing filter is that you can literally "dial-in” the effect you want. They reduce the amount of light reaching your sensor by about 2.5 EV. That means that you need to increase the normal exposure or ISO. If you shoot in any automatic mode (A/Av, T/Tv, P or A), your camera will adjust automatically for you. You probably won’t want to use a polarizing filter on a cloudy day. They do NOT work well with VERY wide-angle lenses (28mm or wider). This is because the amount of reflection reduced varies by the angle of the light source. A wide angle lens can take in so much area, that only part of the image will show the effect of reducing reflection, while the rest of the scene won’t. This is particularly evident in images with a lot of sky. Some images REQUIRE reflected light – these include sunrise, sunset and rainbows. If you own a DSLR, and plan on owning more than one lens, we recommend purchasing a 72mm or 77mm filters. Chance are that you don’t own a lens that takes a 72mm or 77mm filter, but, read our e-Tip on purchasing filters here: http://www.photocheatsheets.com/eTips.aspx?et=15 to see why we recommend that. Although 72 or 77mm filters may be more expensive, is cheaper than having to buy multiple filters for multiple lenses. Now the hard part: The manufacturing process for polarizing filters is much more complicated than for other filters. They contain multiple layers and the mount has to be able to rotate. Although you can find relatively inexpensive polarizing filters, these are a poor choice as they WILL degrade your images. There are two reasons for this. 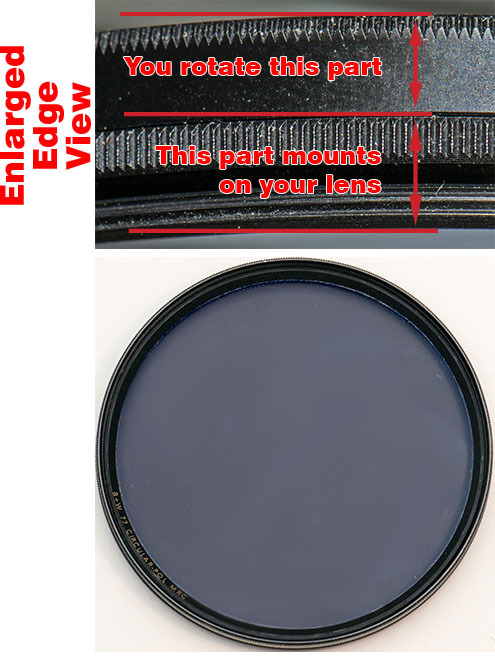 One: they use poor-quality elements (remember, polarizers are made up of multiple layers). Secondly, these filters are not multi-coated. This causes loss of sharpness and excessive flare. When purchasing any filter, it is very important to purchase a good-quality multi-coated filter. A good 72mm circular polarizer can range in price from about $75 to about $150. Smaller filters will cost less. We don’t often recommend spending a lot of money on photo accessories, but in this case, it’s warranted. Also, as with any filter, always keep it clean – there’s nothing worse than a dirty filter ruining your images! Polarizing filters don’t introduce anything to an image – they take something away. By removing reflection, you are able to photograph subjects as they really are – not how they look with bright reflections obscuring their true color. SMALL Lens Pouch - These Neoprene Lens Pouches are very lightweight and well padded. They help protect your valuable lenses.. Medium Lens Pouch - These Neoprene Lens Pouches are very lightweight and well padded. They help protect your valuable lenses..
LARGE Lens Pouch - These Neoprene Lens Pouches are very lightweight and well padded. They help protect your valuable lenses..
X-LARGE Lens Pouch - These Neoprene Lens Pouches are very lightweight and well padded. They help protect your valuable lenses..